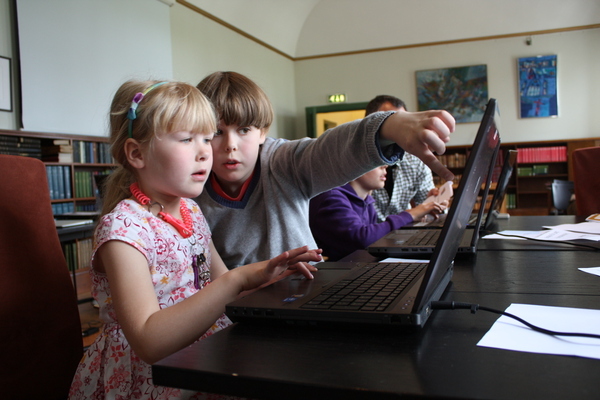 Last summer I was at Edinburgh Interactive and was for the first time introduced to the wonderful organisation Coder Dojo, which is a program or space for young people eager to learn about programming and technology. Bill Liao, one of the founders, took the stage and started reciting a poem which really moved me. He concluded with the statement “We’re teaching our children how to read but not how to write. We’re teaching our children how to use technology but not how to create and express themselves with it.” – it really got to me. Ever since then the subject just kept on popping into a lot of discussions and meetings I was having last winter. Of course, a lot of the meetings I was having, were with very engaged technology enthusiasts. But it was uncanny the way I could be sitting in an introduction meeting between Jill Walker Rettberg and Henchman and Goon where w ended up having an opinionated and enthused discussion about the lack of programming in Norwegian education. And this just kept happening. General consensus was that something had to be done and we might as well be the ones to do it. Meetings were had between me, Jill Walker Rettberg from Digital Culture at University of Bergen, Anne Marthe Dyvi from Bergen Center for Electronic Art, some sporadic members of The Game Developers Guild, Martin Lie, Trygve Trohaug from HackBergen and one of my favourite librarians Sverre Helge Bolstad. 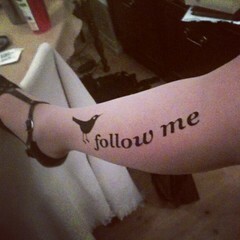 So basically what I’m saying is that I had no choice! I was meant to be a part of this group of people working with kids and programming. And yet I have no children, I don’t work with education and I’m no code monkey! But it’s a subject that I care very passionately about and I find it to be extremely important. Programming is so essential in the future. I agree with Liao that it’s important for kids to learn how to “write” – most definitely – but I also believe that it has some social implications. In order for the future generation to act like responsible informed citizens they will have to learn this technology to understand and fight for their rights, which I believe incidents in the last year prove very clearly. In order to be responsible and informed citizens of the world, these kids need to understand programming and how technology works. Besides – it’s fun! So our little group in Bergen has decided to basically follow the lead from the group in Oslo. They’re so gung ho, effective and hard working – we feel so privileged to be able to work under their model. They’ve established a code club, built a wonderful website and started building programs to teach kids programming. The format that I’m really enjoying is the one where they’re teaching older kids how to teach younger kids programing with the game developing program Scratch. Our Martin is enthralled in this. We found our time limited in Bergen and decided that at first we just wanted to create an event to make people aware of our existence and what we want to work with. We found that we all had different things we wanted to explore and we thought it would be great to let the kids tell us about them. So tasks were delegated to different people interested in Raspberry Pi, Arduino, Scratch, Nxt Lego Mindstorms, Move the Turtle, Hopscotch and I was in charge Minecraft and GameMaker. 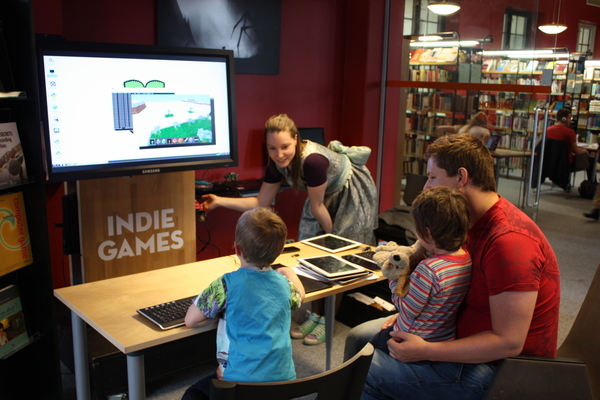 It’s worth noting that I hadn’t initially intended to include GameMaker but coincidentally I met a wonderful woman at a course on how to start a business who had a son who loved creating games with it – which blew my mind! And he agreed to give a presentation (and did a great job). 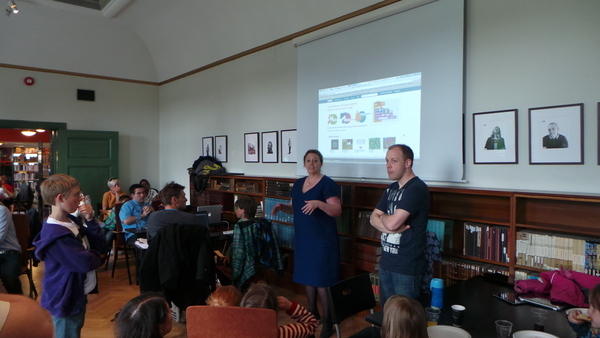 Our event was to be at the Library in Bergen on the 8th of June. Our library is so incredibly awesome at engaging in activities devoted to digital narrative. I feel so lucky that we have these amazingly devoted librarians in my home town. Along the way I “interviewed” two kids who played Minecraft and were willing to stand at a Minecraft station to teach us stupid adults about all the stuff they are doing in this wonderful world. I enjoyed these so-called interviews immensly and I wish that I had more time available to devote to them and create a structured event together. But we just went with our impulses and turned up at the library hoping for the best. The event started officially at 12 and people started streaming in around 11.45 am wondering where everything was. Over 100 parents and children turned up and I think everybody enjoyed themselves immensely. I certainly did and I know that a lot of the kids did. They instantly found common ground and learned from each other. 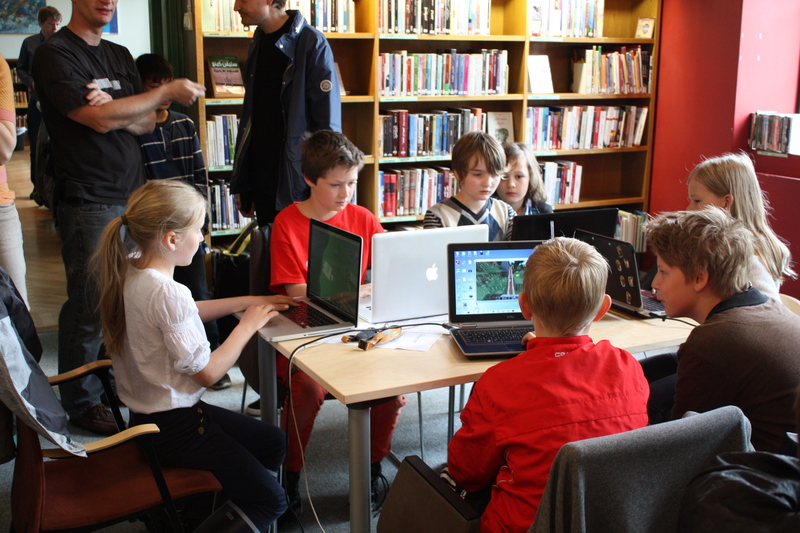 I had been searching for Minecraft modders and failed, but they turned up to this event and I was so ecstaticly pleased that they were girls! We organised a little presentation round which I administrated and I think it went really well. 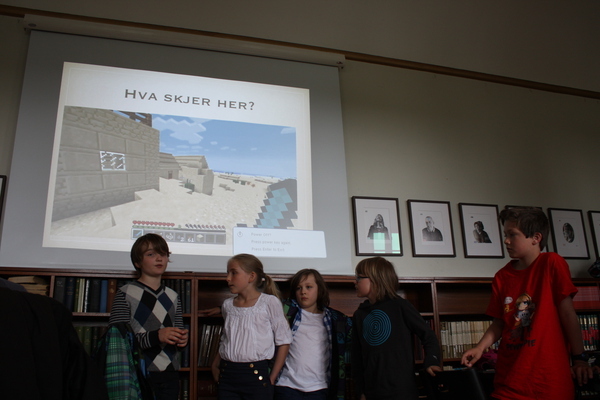 Martin talked a bit about the Scratch program, Anne Marthe and her son shared with us their adventures with Scratch, an amazing woman called Suzann talked about the Rapberry Pi and I interviewed a panel of young Minecrafters. The panel was supposed to be only 3 kids, but it doubled very quickly. I was a little afraid that they might be too shy, but there was just no stopping them! They ran me over with information and enthusiasm. I had just googled some pictures from Minecraft and asked them to describe what was happening. It was so much fun hearing about their experiences and it also felt kinda great to see how cool they thought it was that we actually wanted to hear. They almost seemed grateful for the opportunity to FINALLY teach us dull adults about this exciting world. I had so much fun working with these kids and I hope that I will get several more opportunities to learn from them! I definitely want to do more of this type of work. It was rewarding and fun! A huge thanks to the wonderful Grethe Melby who generously donated both her kids and über cool Jens who I got to meet while playing World Peace Game.